After my first experience of afternoon tea at The Sanderson Hotel, I have been meaning to try another place for ages now. Today it was suppose to be the 3 of us but V.P could not make it at the last minute so it was just me and S.H, both of us having only been to one other afternoon tea before. S.H actually picked out Kingsway Hall Hotel and upon researching it, I found it had decent reviews and for only £19.95 for the traditional afternoon tea, but they also had the option of champagne tea and vegetarian afternoon tea. They do have a 15% service charge but one of the things I noticed immediately was how good the service was here. Kingsway Hall Hotel is literally 5 minutes walk away from Holborn station (and about 8 minutes walk away from Covent Garden station). When we entered the hotel we saw the receptionist and was going to go up and ask them where we go for afternoon tea but seconds before we made it there, a friendly staff member came striding in from the right to greet us and then showed us to the restaurant which turns out, was only to the left of the reception desk. We were then led to our table by a waitress who first let us choose where we wanted to sit. The one thing that saw of gnawed at me this afternoon, was the dimming of the lights. Now when we first went into the restaurant and this was around 4:30pm it was already too dark for my liking but as time went on the lights must have dimmed at 3 different intervals, each time getting darker, someone obviously not happy with the initial setting. The tea selection at Kingsway Hall Hotel is from Twinings, S.H had the traditional English and I tried the white tea and pomegranate. I was really scared the white tea would be slightly perfume-tasting as white tea is a popular scent for hotels in Hong Kong but when I tasted the tea I was pleasantly surprised, it was not too bitter or too sweet and you could actually taste the pomegranate coming through. Okay so some people just delve into whatever they want first but like having a 3 course meal, I like to start with the savoury (bottom plate) and make my way up to the scones and then the desserts. There were 4 different sandwiches; ham and mustard, egg mayonnaise, smoked salmon, and lastly cheese pickle. They pretty much were just standard sandwiches and edible, however I realized I am not a fan of salmon sandwiches. I rather have them sushi-style and fresh. Although the smoked salmon was not fishy here so that is a bonus. My favourite had to be the cheese sandwich with the nutty bread. 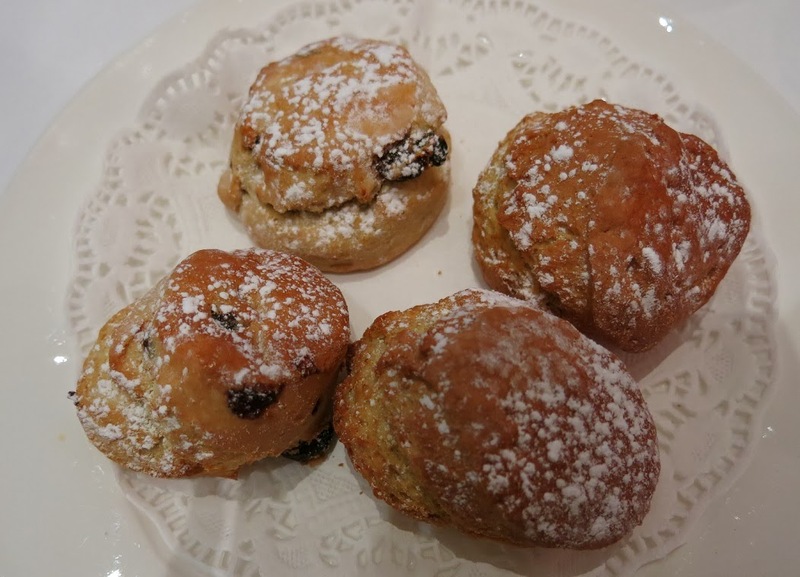 These scones were just amazing. Seriously. They were plain buttered scones but one had raisins in it. The outside was slightly crispy and the inside was nice and soft, and warm! I just realised I did not take a picture of the jam and clotted cream. Shame on me. But there was a separate plate with a small bowl of strawberry jam and a ball of clotted cream which was soft and easy to spread onto the scone. I think the scones were definitely the stars of this afternoon tea. Another thing that I loved about this afternoon tea is that the desserts and scones were unlimited! S.H had to double-check because she thought she heard wrong when our waitress told us that but yes it is (I was in my own world, I thought the waitress said animated and was wondering what the hell that had to do with cakes and pastries). First off was the fruit tart which we shared, I liked the creme filling and the fruits were fresh but the pastry was slightly too thin and crispy for my liking. Second I had the carrot cake which was very stodgy, I found it was more a brownie than a cake (maybe it was). Third I had the lemon eclair, I did not know it was lemon and happily bit into it. People who like lemon desserts will love this but not I. My favourite was the strawberry sponge cake with the flower chocolate on top, I could of eaten another piece of that. The heart-shaped macaron was raspberry flavour, my favourite but the yellow one was lemon. Lastly I thought the brown cake would be chocolate (the best for last) but how wrong was I, it was coffee-flavoured and quite bitter because it had dark chocolate as well. Our waitress was very attentive and came to check on us about 2-3 times. The restaurant itself is very modern and open with glass windows and walls which I liked.